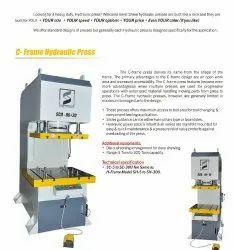 Providing you the best range of cup drawing software for hydraulic press, hydraulic press and load tester for hydraulic press with effective & timely delivery. Hydraulic Unit:Oil Tank :- 250ltr. (Without Oil) .Ele. Motor :- 10hp 1440rpm 3phase (ABB/Siemens)Hyd. High Pressure Vane Pump :- Veljan/YukenDirection Control Valve :- YukenPressure Switch:- PolyhydronPre. Gauge :- MicroHyd. Accessories :- Hydroline, JacktechMax. Pressure :- 300 kg/cm^2Electrical Parts:Switch gear: Siemens/SchneiderStroke counter: Multi span• Electric Heaters.• Separate temperature Controller.• Pressure switch and Holding timer.• Auto and Manual Operation.• Mica Sheet for avoid Heat transfer. 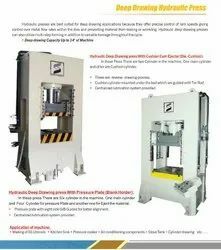 Hydraulic presses are commonly used for forging, clinching, moulding, blanking, punching, deep drawing, and metal forming operations.With the growth and importance of light-weighting in the aerospace and automotive industry, more applications are present in Thermoplastics, Composites, SMC Sheet Molded Composites, RTM Resin Transfer Molding, GMT Glass Mat Transfer and Carbon Fiber Molding. All of these applications require precise control and repeat-ability. record data of every press stroke to assure parts meet compliance issues. With I-PRESS Connected Enterprise, users can download and store part to part information that includes, press position, tonnage, speeds, temperatures, automation location, in-feed of material, part exit and more. With the ongoing surge towards light-weight parts for aerospace, automotive appliances and many other industries, Servo Hydraulic and Hydraulic presses have become a key tool for the Thermoplastic Industries. Otherwise known as compression molding presses, control of speed, pressures, position, heating and cooling mould temperatures can be managed with the I-PRESS HYDRO controller for press and automation functions. Tec Sol Load Tester for ALL your Hydraulic Presses. ---- Portable Model Why Load Tester? 1) Now, Easily check the exact Load applied on any of your Hydraulic presses in your plant. 1) Load control facility along with red light and an alarm, if it is above the limit it will give alarm. 2) Load controlling provision along with Load holding for few minutes. 3) Interface with PC and Printer.